August 20, 2014 marks the official launch of The NY Aesthetics Professionals Network 2014 POWER LUNCH series. This special assembly is the first of a series of connective summits between selected practitioners and business owners in the beauty and wellness industries. The NYAP was developed largely from the research powers of LinkedIn's social media tools, blog articles and online bios. Business friends, referral sources and alliances were initiated through LinkedIn's (digital) messaging system and then progressed into personal phone and coffee meetings. "Using digital media effectively requires fundamental keys to growing a successful alliance... you have to establish the right relationship parameters by getting a real "who's who" before getting into assembling group meetings," says moderator and group manager Lennard Gettz. "We have benefited from LinkedIn's interactive structure to allow us to learn about everyone to get the right start on a healthy connection and professional matchmaking." “Use virtual to build real” is the moto behind the NYAPA blueprint. Founders were committed to breaking the digital anonymity induced by our dependence to “texting and tweeting” by driving phone introductions and face-to-face coffee meetings with a plan to form a synergistic network. They outlined an executable model under a 3-tier schedule: (1) digital messaging to introduce, (2) phone and personal 1-on-1 meetings to establish “human contact” and then (3) mini-group meetings to forge alliances. "We took some of the connective modalities of dating sites, craiglist communities, chamber groups and digital event planners to develop the building blocks of this alliance... we needed the right relationship parameters by getting a real "who's who" with everyone and LinkedIn greatly helped to identify (not just professional but) personal characteristics for this level of connection!” says network co-planner Carmen Regallo-Dewitt (of imworx.com). Since January of 2014, midtown-based cosmetic and anti-aging dentist Dr. Veronica Greene alongside educational marketing advisors Grace Dellavalle and Lennard Gettz of responseli.com reached out to a list of NYC-based beauty experts, psychologists and plastic surgeons on a ground-level search to interview potential contributors for a joint-writing project called MASTERING THE POWER OF THE PERFECT SMILE. Soon after, their new found relationships inspired even greater ideas for building joint-partnerships and entrepreneurial projects including a plan to build a NYC-based synergistic business resource group for the personal enhancement industries. Implementing this campaign through LinkedIn allowed Dr. Greene and crew a fast and effective work flow to seek out and connect with practitioners, experts and fellow business leaders. Within weeks, hundreds of professionals came forward on various levels of success-- many of whom are in progress of career advancements and professional expansions such as doing product development, publishing a book, producing video educational projects, winning t.v. exposure, opening multiple practices, producing trade shows and other marketing endeavors spanning from local to global sights. "LinkedIn is such a valuable tool that most people take for granted," says Dr. Greene. "To use it correctly, I had to create a completely new and separate LinkedIn account (from my general one) that focused only on connecting with a specific grouping of professionals, and I made a real commitment to manage and reach out to every single one of my new contacts. Using LinkedIn on outreach campaigns is a sensible way to track and organize relationships as well as joining (and interacting with) LinkedIn groups, getting noticed by the community and making personal introductions. It wasn't long before I found some remarkable leaders, creative talented visionaries and role models that I personally enjoy speaking with and getting advice from!" Throughout the four-month search process, Dr. Greene and the growing member list focused on professional and personal commonalities on a one-on-one level. Most individuals took well to connecting with her, but the next challenge is having enough common ground with all the members to fulfill true compatibility to have an actual group. Where typical networking mixers welcome an unlimited number of members, synergy can only happen from forming SMALL GROUPINGS of intimate and genuine connections to form real alliances of entrepreneurs. "The most you could hope for in a network to generate mutual support is SYNERGY," starts Tami Racaniello. "This is hard when the web (and the world) throws so many faces at you - but NYAP may have the answer by doing a whole series of preliminaries and filtering only a handful of good people at one time who can get along fairly well with similar beliefs." By June of 2014, the website (www.nyaestheticsnetwork.com), the virtual blog group (NY Aesthetics Professionals Network of LinkedIn) and a series of partnership-based projects were launched proving the effectiveness of the outreach plan for collaboration. With the infrastructural support of Dr. Greene and fellow business planners, the NYAP was born - powered by the common vision to share information, give support and partake in partner-based projects. "Before this, many of us pretty much traveled as solo practitioners working alone in our own businesses... this poses many limitations. But meeting other minds from different areas of personal advancement is so enlightening - I learned so much about my own industry just by listening to everyone's experiences," says Diane Schreck of Image by Design. "With an alliance of this strength, I believe there are so many opportunities for growth that we can achieve collectively as well as individually. The value of an experience-based support system such as what we have here with NYAP is immeasurable". 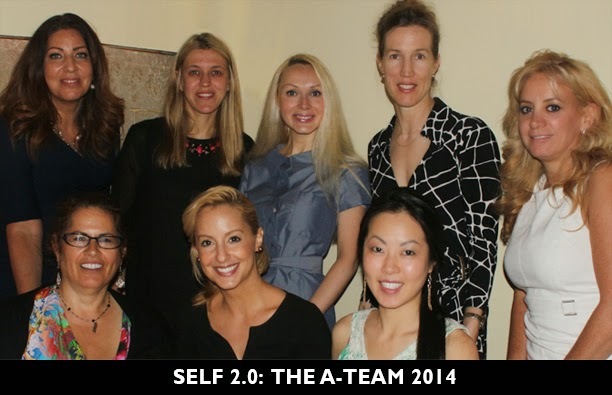 This SELF2.0 Group #1 includes: RIKA KECK (health/nutrition advocate), AMANDA GABBARD (pro makeup artist/beauty consultant), JOYCE GALANTE (laser technician/ hair removal) , DIANA SEO (skin lab specialist/ skin rejuvenation), DIANE SCHRECK (fashion/style consultant), DR. JENNIFER CAPLA (plastic surgeon/body contouring medical specialist), TAMI RACANIELLO (wellness expert) and co-founder DR. VERONICA GREENE (cosmetic & anti-aging dentist). Where business leadership takes flight into new ventures, these select professionals have connected confidently on many levels and are already underway a growing list of co-marketing ideas, educational platforms, events, industry resources, client referrals and so much more. Individually, these "entrepreneur-ettes" are role models in their own right. To start, Amanda Gabbard has been featured in countless magazines, online articles and radio interviews as a beauty personality expert. Diana Seo is growing her skin spa to multiple locations in downtown NYC and Westchester. Dr. Greene is in the final stages of launching a series of beauty products domestically and is undergoing talks with major investors. The fact that they have all met on the common ground of wellness and beauty is only the first layer of solidarity. "It is remarkable to be part of a group where every single person has the greatest things in common... they all have the will to dream and the strength to pursue - that's what makes being here so inspiring," states Amanda Gabbard, beauty specialist. "It's empowering to cover the major bases of the enhancement industries with the most amazing and fun personalities who are ALL intelligent, experienced and really compassionate!" The final piece of the blueprint came from recent inductees Rika Keck (Corporate wellness speaker) and Tami Racaniello (of 'It's Time to Get Fit') who inducted an entire holistic addendum to the Aesthetics Network plan by adding health, fitness and nutrition experts into the roster- shaping the group name as "SELF2.0." "You couldn't have a community of personal image experts without the presence of health and wellness... those are the vital elements to anti-aging and longevity and that's what makes looking good a strong partner of living well," remarked Joyce Galante.